Children all over the world pray, sing Primary songs, and learn about the gospel﻿—just like you! This month let’s meet Omar Salgado of Valle de Angeles, Honduras. Birds and cats and dogs don’t always get along very well. Usually one of them is chasing another. But at nine-year-old Omar Salgado’s house in Honduras, it’s not unusual to see him with the family’s bright green parakeet on his arm while the cat looks down from the roof or for the cat to pad quietly around the outdoor kitchen while the dog rests near the door. Everyone seems to get along. Omar smiles as he puts the parakeet back in its cage so he can go feed the chickens. He’s happy to help take care of his family’s animals. Helping out doesn’t just make his parents happy﻿—it’s one of Omar’s secrets to getting along with others. Everyone in the Salgado family gets a chance to help out. But being the oldest, Omar knows his parents expect him to help his younger brother and sister when they need it. Honoring his parents and strengthening his family are important to Omar. The Salgados have to rely on each other because they don’t have many neighbors. The closest house is at least a 10-minute walk away. So even though he gets to see friends at school and at church on Sundays, Omar spends a lot of time with his six-year-old brother, Arnold, and four-year-old sister, Nathaly. Just like their animals, they get along pretty well. “We try not to fight,” Omar says, because it’s more fun to be friends. When Omar, Arnold, and Nathaly are together, they can find plenty to do. The family likes to sing hymns together. Omar’s favorite hymn is “Teach Me to Walk in the Light” (Children’s Songbook, 177). The trio play games a lot. One of their favorites is hide-and-seek, hiding from each other in and around their house and in the surrounding woods. Another favorite is tag. They chase each other all over the clearing around their house. “I like to play with him,” Arnold says of his older brother. While Arnold likes to play with Omar, Nathaly likes to draw with him. Omar enjoys drawing and coloring with his colored pencils. Usually he will draw landscapes, mountains, and houses. It’s no wonder. There are plenty of beautiful things to draw where he lives in the mountains near Valle de Angeles, a town known for its skilled artists. Even the name, which means “Valley of Angels,” is beautiful. The valleys and mountains that surround Omar’s house are filled with beautiful trees and plants. In fact, Omar’s family lives on a flower farm, where his dad takes care of flowers that will be sold because they’re pretty. Omar fills entire notebooks with his colorful drawings. And often Nathaly can be found coloring right beside him. Getting along and doing things together help strengthen Omar’s family. So do going to church and reading scriptures together. At Primary, Omar learns about Jesus, and he says learning about Jesus helps him know how to help his parents and be a good son. Omar especially likes to read stories from the Book of Mormon. “I like Nephi,” he says. His favorite stories are about the iron rod and Nephi building the ship. Nephi was a good son, who always tried to strengthen his family. 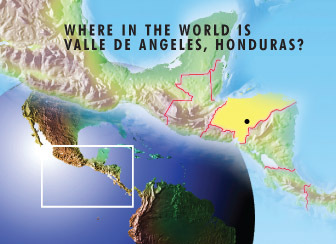 Where in the world is Valle de Angeles, Honduras?